﻿ Kolon Hotel, Gyeongju-si | FROM $62 - SAVE ON AGODA! "The hotel has an excellent location for Bulguksa temple and..."
Have a question for Kolon Hotel? 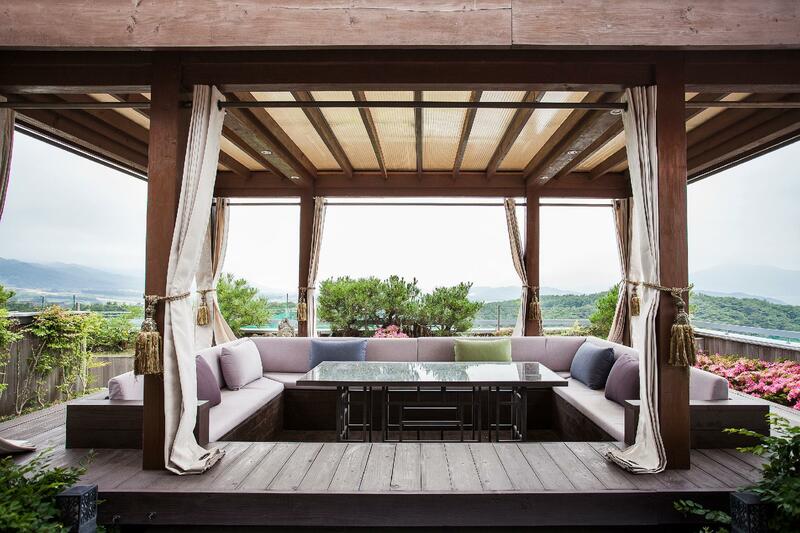 This opulent designer hotel, situated within close proximity of the Pulguksa Temple, is 30 minutes from the Kimhae Airport. Guests will enjoy a location that is just 20 minutes from the Kyongju Bus Terminal and 30 minutes from Uslan and Pohang Airport. The location of this hotel provides guests with easy access to public transportation areas as well as the international airport. The rooms are spacious with an elegant design scheme that is visually relaxing with its muted tones accented by flecks of warm colors that provide the ultimate atmosphere of luxury. The hotel is nicely equipped with a coffee shop as well as the Pouching Restaurant which serves a delightful variety of authentic dishes. The Kolon Hotel is the perfect luxury destination for guests who want opulent decor, a host of amenities, and a comfortable selection of accommodation options. The spa, sauna, and convenience store are closed every first and third Monday of each month. The rooms are spacious and quiet, there was neither notable noise from inside nor from outside the building. Much appreciated the very comfortable hard mattress, the big mirrors, the wifi, the modern TV with plentiful channels, the experienced and professional staff, the convenience store inside the hotel. There are many things to explore in the vicinity and in the hotel, but unfortunately stayed only one night and had not much time. 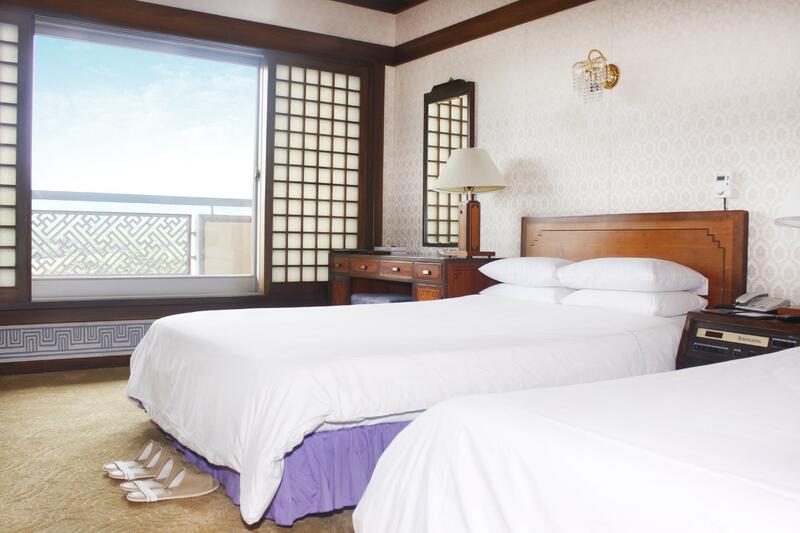 The hotel has an excellent location for Bulguksa temple and the Seokguram grotto. It has a golf course pool and other leisure facilities. Otherwise there is nothing in the near vicinity as it it far from central Gyeongju. Overall standard is good and clean although slightly dated. Breakfast mostly Korean food and quite expensive. Dear Guest, Thank you for your reviews. As you mentioned, our hotel is a little far away from Bomun Tourist Complex, a central Gyeongju city. But the hotel is located to close Bulguksa temple with 3 min distance by car and you can enjoy real Gyeongju city. Appreciate to your stays again and we hope to see you again in your next visit. Brunch was nice, plenty for both our parents and the kids. The lobby and golf course was nice but the room definitely needs renovations. Then bathrooms in both rooms had mold and wear and tear was evident. The rooms were small with lots of wear and tear including chipped table, old carpeting and furniture. The light switches are old school and just even the use of the key not a card swipe could be upgraded. I felt it wasn’t worth the hundreds of dollars we spent. staff can speak in English and Chinese, newly renovated and hotel near bus stop 5min walk. when we check in the staff can speak well in English and Chinese and they all helpful give us a lot of information. And the hotel near bulguksa temple 5min walk and the hotel is renovated not mentioned as old building. And the viewing is beautiful nice and comfort stay. Kolon had an exact room that I was looking for - clean and affordable twin bedded. Also very close to famous temples and grottos. It only took 5 min to Mt.Toham by car, a beautiful mountain of Gyeongju. You can enjoy the short golf game with reduced fee as hotel guest. A little out of the way, this hotel is pleasant but far from the main cluster of hotels in Bomun area. That said, there are buses that stop close to the hotel grounds. If taking a taxi from the bus terminal or train station, it might be quite pricey. Hotel is old but comfortable. Good for families and people looking to relax. it's a bit far from the train station but the hotel receiptionists provided us the superior service once we steped up into the hotel. remarkably, we were given the tiny gift as a warm welcome from the hotel while checking in that makes us so happy. in addition, when we checked out for another location in different city, we obtained the best confort and service while taking a taxi to the ktx connecting to seoul. thank you very much kolon hotel. The Kolon Hotel is a full-service resort in a beautiful setting among the mountains. We were happily surprised at the size of the room. Our day of trekking to the many temples in the area, was peacefully capped off as we relaxed in the restaurant overlooking the beautiful valley and mountains. Close to the Bulguksa Temple, pleasant outlook and surroundings facilities. A little bit far from downtown. The hotel is old inside and is lack of room facilities. 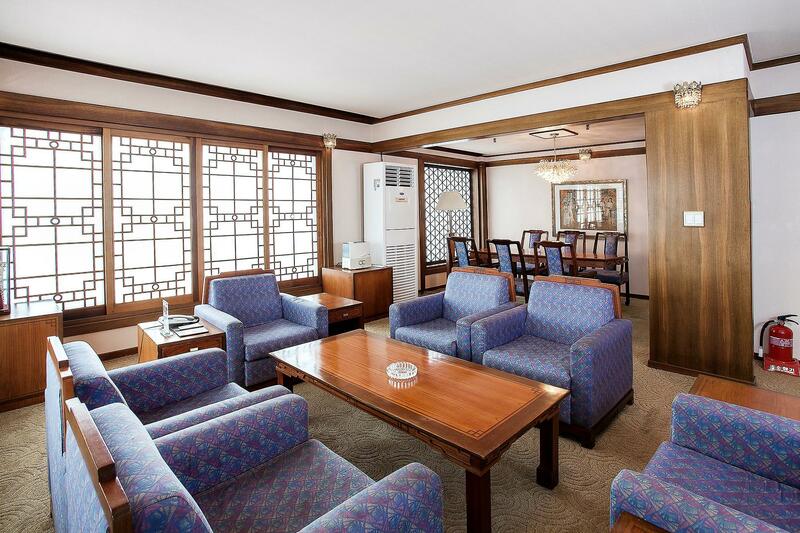 The hotel is near to the Bulguksa Temple, pleasant outlook and surroundings facilities e.g. golf courses, spa etc. Service is okay but the staff is not that good in English. On the other hand, its a little bit far from downtown. The hotel is old inside and is lack of room facilities. I think its only good for one-day stay. Nice hotel, convenient to two of the top tourist sights in Gyongju. Nice gift shop and restaurant. It is a very nice hotel and resort. The rooms were nice and spacious. We ate supper in the restaurant, enjoyed that a lot. They had live music in the seating area and that was very pleasant on a wintry day. The only drawback was not the hotel's fault as the taxis would not come up there due to the depth of the snow. The buses were running so we were able to get in and out. 1 far away from Gyeongju Station. (For taking bus 11, it takes about 25-30 mins) 2 far away from the urban area (The hotel itself is surrounded by its own sport facilities, such as golf court) Somehow isolated. Hotel Kolon toke us by surprise, altough the rooms a not so big and a bit dated, the location was perfect for us. The hotel offers a spa- hot baths and sauna which we used every day. You can walk (1 km) to the must see temple of Silla Kongdom - Bulguska. If you like walking you can reach Seokguram grotto within the hour Hotel staff are friendly, offers free internet and an excellent breakfast buffet. Tour operators offers 1-day roundtrips to the various sites. A former grand hotel , hotel Kolon is an excellent choice if you want to get away from the husle and busle of city centers. Very good hotel! Very nice position if you have a car. A little bit worn, but very clean. I stayed one night in Kolon hotel and i was very pleased of it with my family. Very clean hotel and the staff was very nice. The breakfast was very good ( More then we expected). Next time we'll stay again here, for summer time this hotel can offer everything for a lovely holiday ( a nice walk aria around, swimming pool, sauna, tennis ). WE also ate in Korean restaurant. It's fantastic! Large room, next to main temple, golf course. A fair way out of town amongst the greens of the golf course. Stayed out of season so pool was drained. Our room was huge and very comfortable. Breakfast 'buffet' is a rip-off; not a buffet but a poorly cooked meagre selection of food. Eg. Continental breakfast is three pieces of bread. The staff don't speak much English so were unable to be very helpful. We stayed at hotel because of it location. We only had one day/night free to visit and this hotel gave us the chance to visit the temple in the late afternoon we arrive and the grotto in the early morning before we checked out. Hotel is very old and while clean it does feel old. New covers on the beds would certainly brighten the aspect. Seems to have great facilities, golf course, play area for kids but we did not look at these as the sightseeing was our only objective. Breakfast was ok, not the most amazing but filled us after our early morning hike up to see Seokguram Grotto. Staff were very courteous and polite. The hotel is conveniently located within walking distance of Bulguksa and Dongri Mokwol Museum; and bus ride to Seokguram Grotto. Overall, the staff and service was great. The location is near 3 major attractions on the Cultural Heritage Stamp Tour (Bulguksa, Donri Mokwol Literary Museum, and Seokguram Grotto which is great for first time visitors to Gyeongju. The taxi cab driver said it was the oldest hotel in Gyeongju and it showed. The furniture and decor were dated.. possibly from the 1970s or 1980s. If the hotel would renovate and revitalize its look for modern times, it would be more attractable for more tourists. The first thing is you have to pay for everything unless you book the room with breakfast. You do get a free coupon for the spa. The Pool is nice but it cost 9,000 WAN per person. The staff was very helpful and spoke moderate English. The room was a decent size however it was in the smoking section I don't know if there is a non smoking, we smelled a hint of smoke when we checked in but they did a decent job of covering it up. The Aircon was really weak to one day to get comfortable.